Study: Swift Parrot Population May Decline Up To 94 Percent In 12 To 18 Years. Sugar gliders are being blamed for the grim numbers, but researchers are ready to do what it takes to save the swift parrot. The study found that “when sugar gliders prey on the swift parrot nests in areas where there was high forest loss, 83 percent of the time the animals ate the eggs and mother.” In some cases, the mortality rate could be as high as 100 percent. So, it’s all about cause and effect, and increasing competition for dwindling resources. Researcher Dejan Stojanovic said the research found if nothing changed, the bird’s population would decline by as much as 87 per cent. Across southeastern Australia, the forests and woodlands where swift parrots live have been converted to farmland, swallowed by urban sprawl and been chipped away by logging. The Conversation: Sugar gliders are eating swift parrots – but what’s to blame? They are very light birds, weighing about half as much as a banana – which is lucky, because they fly ridiculously long distances during winter, to forage for food and to escape the Tasmanian winter. These are tiny, kaleidoscopic technicolour parrots fly all over Australia, but come back to breed in the forests of Tasmania. They may be going to the way of the dodo, researchers say. Environment Tasmania said information documents revealed evidence of the Department of Primary Industries, Parks, Water and Environment (DPIPWE) that approving logging in parrot breeding habitat despite strong scientific advice against activity in the areas. The DPIPWE departmental group also advised that logging was “… likely to interfere with the recovery objectives of the species”. Parrot breeding habitat had already been extensively logged over recent years and that made remaining patches of swift parrot breeding habitat more important. They migrate from the Australian mainland to Tasmania to breed each spring, swift parrots rarely reuse the same nesting area in successive years. They nests are most abundant in old growth forests, but finding nests for research demands an intensive annual search across the east coast forests of Tasmania. “Everyone, including foresters, environmentalists and members of the public will be severely affected if they go extinct,” said Professor Heinsohn from the ANU Fenner School of Environment and Society. 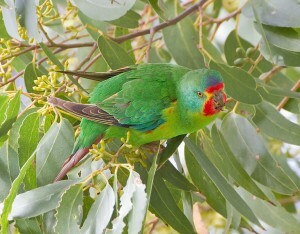 Swift parrots are major pollinators of blue and black gum trees which are crucial to the forestry industry, which controversially continues to log swift parrot habitat. Making things go from bad to worse, Forestry Tasmania is considering selling nearly 40,000 hectares of hardwood plantations, after the Tasmanian Government gave it the green light to sell assets. Selling hardwood plantations would force Forestry Tasmania to log more native forests, which would “drive to the brink” endangered species like the swift parrot and the masked owl. Native species are now no more than collateral damage in the quest to capitalize our our natural heritage, and resources. Mr Roderick from Birdlife Australia estimates there are three to four hundred regent honeyeaters remaining, making it and the swift parrot the two most endangered of a whole suite of threatened woodland birds. A recent Wilderness Society report has found Tasmania’s Regional Forest Agreement (RFA) is failing to protect forests and wildlife. Spokesman Vica Bayley said so far the agreement had been a failure. “We are still logging critical habitat for species such as the swift parrot,” he said. Help save critically endangered Swift Parrots and Regent Honeyeaters in the Hunter Valley!